Pittura per l’eternità (painting for eternity”) is what painter Domenico Ghirlandaio deemed the art of Pietre Dure in the 15th century. Polychrome hardstone inlay uses delicately thin slices of highly polished colored stones that are cut and fitted together to create images; assembled so precisely that the contact between each section is practically invisible. 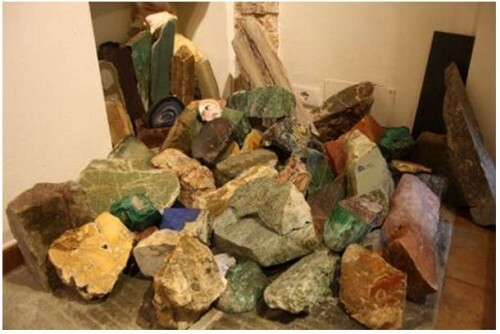 Semi-precious stones like coral, garnet, malachite, jasper, lapis lazuli and amethyst are arranged in compositions to look like paintings; the natural grain of the stones and marble is exploited to create incredible effects (clouds, leaves and petals, skin, fur, etc.) that at first glance look like paintings. The art is known worldwide as a specialty of 16th century Florentine artists, but it was also practiced at the courts of Naples, Madrid, Moscow, Prague, Paris and elsewhere. The colorful stones were arranged on tables, large and small, jewelry chests and cabinets of curiosities, to create landscapes and flower scenes. 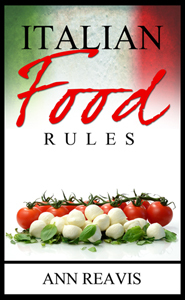 While the common belief is that the art form originated in Italy, some scholars argue that it had an Indian origin, or at least an independent history in that country. A famous example of pietre dure is the Taj Mahal, finished in 1643. The Mughal emperor Shah Jahan asked for precious stones to be inlaid in white marble. The result was some of the most impressive pietre dure architectural designs ever crafted. 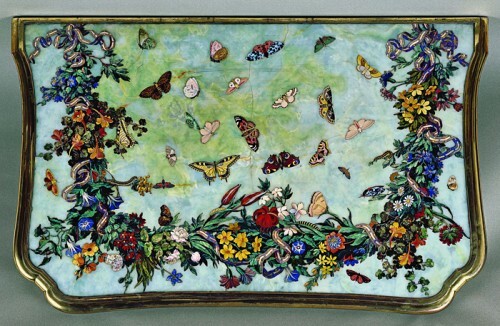 In 1588, the Medici Grand Duke Ferdinando of Tuscany founded a workshop for the purpose of developing pietre dure and other decorative art forms. The ducal workshop, renamed the Opificio delle Pietre Dure, which eventually became a museum and restoration laboratory, still exists today and it is the first place a visitor to Florence should go to learn more about the technique of inlaid stone. (Via degli Alfani 78r, Florence, tel. 055-218709; closed weekdays after 2 pm & on Sunday). 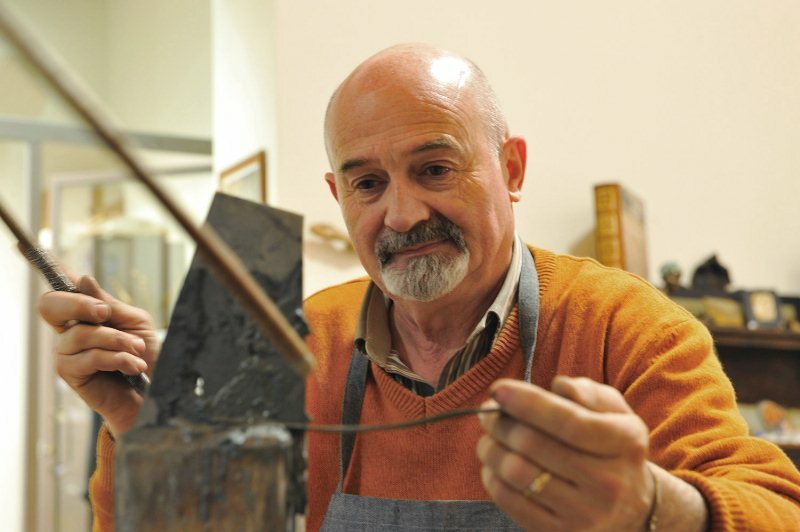 After leaving the museum go directly to Renzo Scarpelli’s store and workshop, Le Pietre nell’Arte on Via Ricasoli 59r. (tel. 055-212587; closed Sunday) There Renzo, his son Leonardo and their four collaborators create Florentine mosaics using traditional methods passed down from the Renaissance. Part art gallery, part laboratory, it is a huge fascinating place, where the old bricks, columns and stones of a 13th century stable have been brought to light after a painstaking restoration. 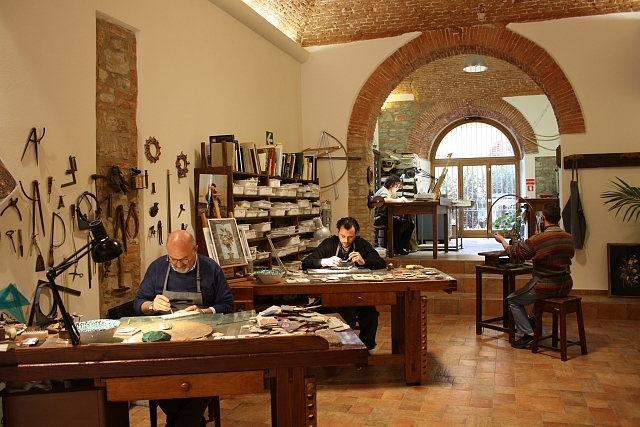 The Scarpelli Bottega d’Arte is open to all visitors wanting look around the workbenches, where the mosaic artists (mosaicist) labor, creating the stone shapes, and thus discover a bit about the secrets of this ancient art. The staff and artisans are invested in helping their clientele understand the importance and intricacies of the art form. Shoppers can purchase a wall plaque, medallion or cameo here, or even commission a unique masterpiece based on custom drawings. Renzo Scarpelli was born in Firenzuola (northeast of Florence) in 1947. 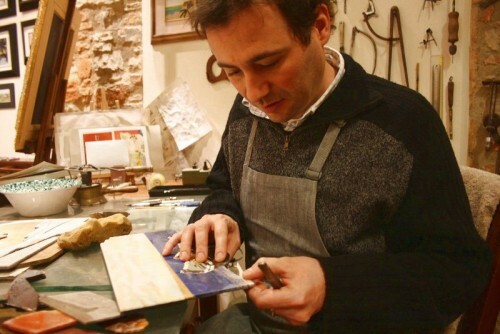 Working in pietre dure was not his family’s business. His personal passion caused him to apprentice in one of the most ancient Florentine workshops when he was only 13 years old. 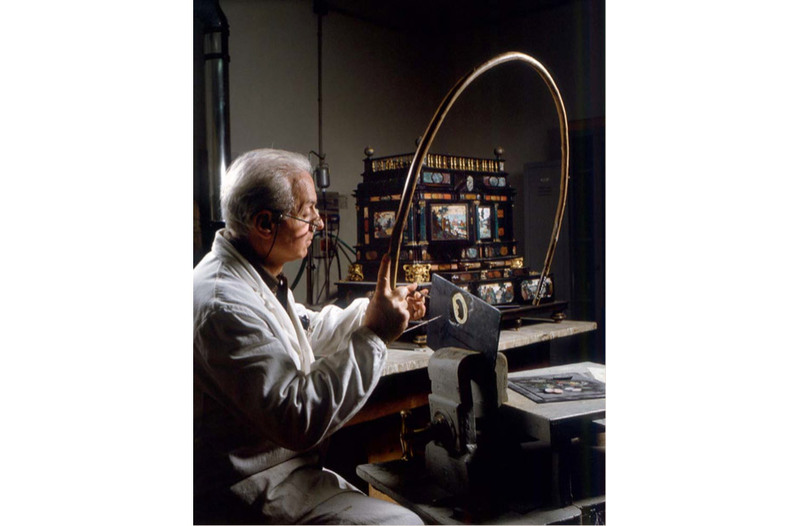 After many years of training and art studies, he managed to open his own studio in Florence in the 1970’s and was thus able to design his first creations in pietre dure, known in Florence as mosaico fiorentino or commesso fiorentino. He is now known internationally as one of the master craftsmen in the field and his works hang on museum walls as well as in fine private collections. Fearing the loss of the art form, he has a deep commitment to using his talents as a teacher and passing down the art of Florentine mosaic work. His son Leonardo was fascinated by the laboratory from early childhood, showing not only a ready willingness to learn, but great skill in his designs and his work with the stone. After completing his studies in mosaics and pictorial decoration, he decided to join his father in the bottega. For over ten years now, Leonardo has been signing works of his own creation and is considered one of the finest artists of the new generation, especially when it comes to modern design. 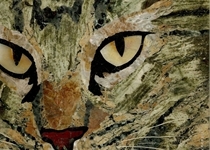 His “painting in stones” is a blend of arts and crafts, tradition and innovation. Renzo and Leonardo work together in the laboratorio and create artistic masterpieces of a very high quality indeed. Stefano and Pierpaolo, who boast many years of experience and a good grounding in painting, cooperate and support the laboratory production following instructions of the master craftsmen. Gabriella supported her husband Renzo throughout his professional career and built up a business of her own in the unique design, fabrication and repair of pendants, earrings and necklaces in stones. Catia, Renzo’s eldest daughter, after years of experience in other fields, has decided to follow the family tradition and is today responsible for running the business side of the company. She is assisted by Mayumi, who is key in sharing the pietre dure story with clients. Craftsmen and artists worked together in an opificio delle pietre dure, or laboratorio, or bottega to create decorative artworks in stone. The painters play a fundamental part among them because they create the sketches. But in the beginning there is the stone. The “stone seeker” (cercatore di pietre) is of prime importance. This is the person who knows everything there was to know about the raw materials and where to find them. In the time of the Medici dukes the maps of the cercatore di pietre were guarded and prized. (See this zen-like video of a cercatore di pietre going about his work.) The search for the right stones, carried out in the same places where Renaissance artists originally found their materials, is still a particularly painstaking job and a vital step in the production of pietre dure. The stones arrive at the laboratory, where each block of rough stone is cut into slices measuring about 3 mm thick. The commesso fiorentino then selects the colors needed from among the various stones, a process known as macchiatura or coloring, essential for the chromatic effect of the work. Then the hard work begins – the cutting and matching (commettere) of the various hues (the origin of the name commesso fiorentino), so as to create a perfect match between the individual pieces and complete the composition of the entire inlaid design. An enormous amount of stone is needed to choose the perfect hue and matrix, which only emerges during the cutting of the stone in its raw state. 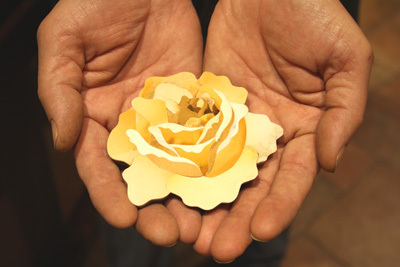 The paper design created by the artist is cut into dozens of small pieces that are then pasted onto the thin stone slices to capture the perfect matrix and color. 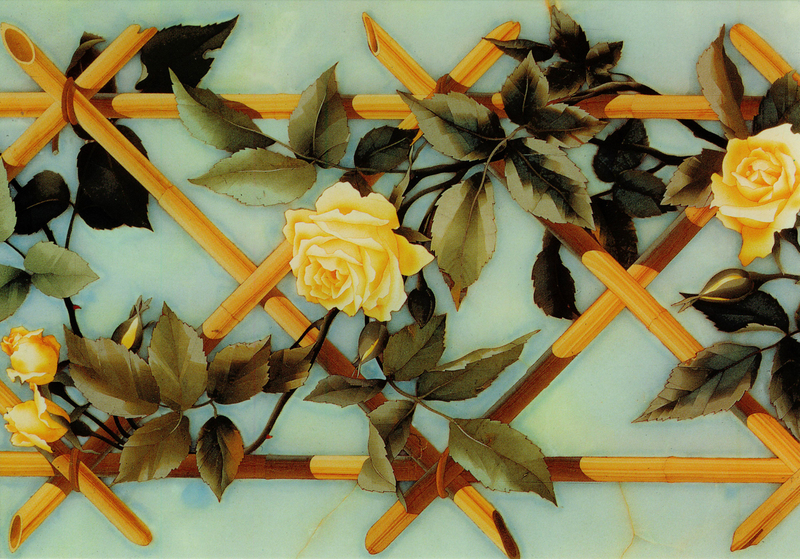 Using the centuries-old technique that employs a curved branch of chestnut or cherry wood and a piece of wire, the artist (mosaicista) cuts each tiny piece by rubbing the stone with scouring powder and water so as to be able to cut the small complicated shapes as precisely as possible. The mosaicista uses a series of files to finish off the shapes of the pieces of stone until they fit together perfectly and then bonds them with a beeswax and rosin paste. A slab of slate is used as a backing and support for the composition. The last step is the polishing, done by hand, which brings out the colors of the natural stone. 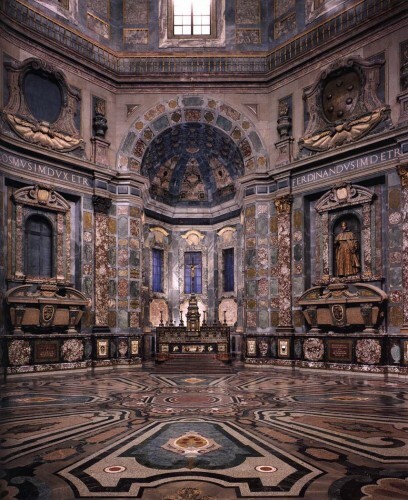 “Painting for eternity” goes to the extreme in the Cappelle Medici, also known as the Chapel of the Princes, a grandiose mausoleum attached to the Medici family church of San Lorenzo. This tomb/chapel/throne room was erected between 1604 and 1640 to celebrate the absolute power of the ruling Medici dynasty. 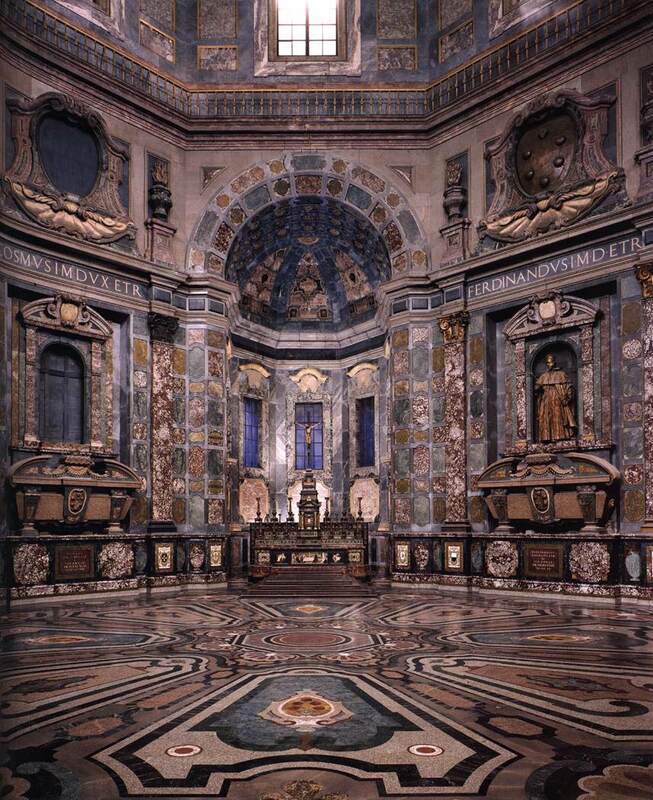 The octagonal room, where many of the Grand Dukes are buried in gigantic sarcophagi, is encrusted floor to ceiling with semi-precious stone and marble inlay executed by the skilled workers employed at the Opificio delle Pietre Dure. An internal coating of lapis lazuli was meant to cover the vast dome, but even the Medici didn’t have enough money to procure the costly stones and, in the early 19th century, it was finally painted in fresco.